Nylon Hose Sleeves reduce the potential for hazardous uncontrolled fluid spray when a hose ruptures. The sleeve will saturate and the fluid will drip rather than spray outward. OK, you have your hose safely restrained using nylon restraints or hose safety whip check cables. But what happens if a hose ruptures rather than breaking at the coupling? Imagine a job site incident where high pressure or high temperature fluid suddenly travels out from a ruptured hose vs one where the hose has a protective sleeve applied. Nylon Hose Protective Sleeves offer an additional measure in hose protection by containing media and deflecting pressure. Nylon restraints slide easily over the ends of the hose and are clamped with an additional hose clamp. 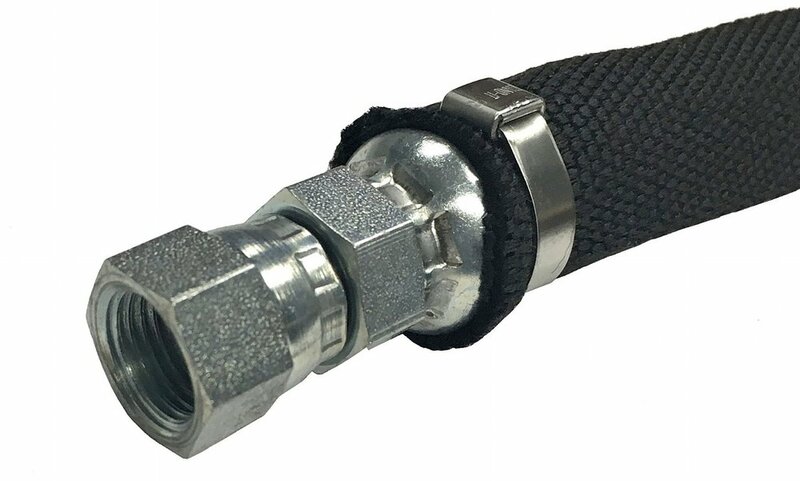 Do not seal the hose coupling to the hose and the sleeve over the hose with the same clamp (in the photo shown, there is a hydraulic crimp coupling and then a band clamp sealing the sleeve to the coupling ferrule). If a hose ruptures, the sleeve will absorb fluid until saturated and then allow the fluid to drip down rather than unsafely shoot out of the hose. This can greatly reduce the risk of injury from spraying hot oils or other chemicals being conveyed. Nylon hose sleeves also protect the hose from abrasion and weathering. This will further reduce the chance of a hose rupture, and increase an assembly's life span. Why not add this additional safety measure if it pays for itself over the life of the hose? Nylon hose protection sleeves are MSHA approved. Kevlar and Fiberglass sleeves are available for extreme temperature and abrasion applications. contact us for quotation and to further discuss your application and installation.